Summer is here... My previous post started in a similar way, only a whole season ago. I spent a lot of time in the garden these past months and it is high time to get back to miniatures. I did make time to visit the Kensington Dollshouse Festival in London last month. As usual it was a wonderful fair where I managed to find some treasures to add to my collection. 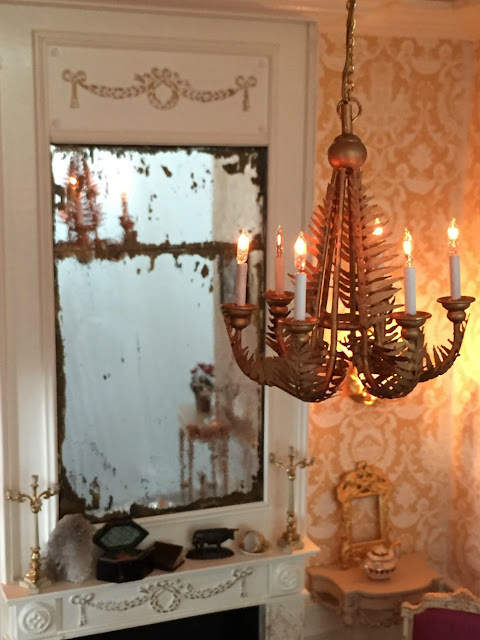 One lucky find was this chandelier, made by Weronica Löhr of Crazy4minis. It's always difficult I think to find the right lights for a room. Well, lights which fit my budget anyway, so I was very pleased to find this chandelier. 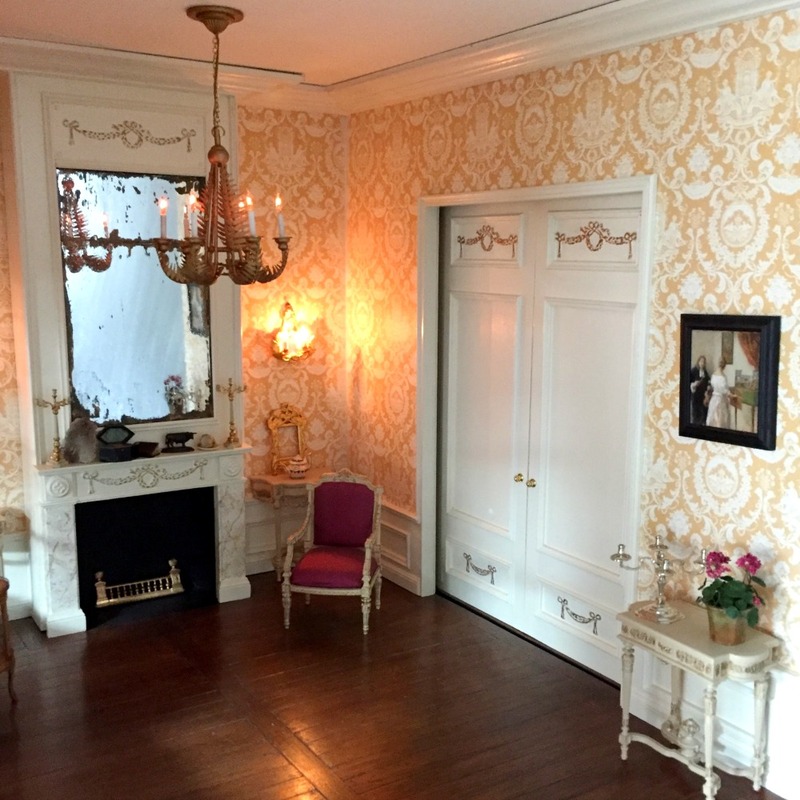 The lines, shape, style and colour of the chandelier are echoed in the decoration of the fireplace and the wallpaper. Perfect for the Yellow Salon. Whenever I'm at the fair in London, I buy some of Gill Rawling's (Petite Fleur) metal plants. This time I bought a pot of pelargoniums (commonly referred to as 'geraniums') for the Yellow Salon. I like the contrast of informal garden flowers and pot to the somewhat formal style of the room. The table (Alison Davies) and the silver candelabra (Jens Torp) are purchases from previous fairs in Holland. I still need candles for the candelabra and I want to make a marbled top for the table. Now that I have the chandelier in place I can finish the ceiling. And so there are many more little jobs to do. Perfect jobs for rainy summer days, although to be honest, I hope there won't be too many of those. Sensational Summer Treats indeed! Sublimely gorgeous. Your chandelier with the fern fronds interlaced throughout is a Unique Conversation piece and fits in well. I also love the delicacy of the silver with the potted geraniums on the side table and look forward to seeing the new marble top you will be making for it. Thanks Pepper! Yes I agree the room has a Summer feel. And quite a contrast to the adjoining Blue Salon. Oh, lijkt me heerlijk om Kensington eens te bezoeken, er zal ongetwijfeld veel moois te zien zijn geweest. Erg mooi, het doorzetten van die 'flora'-accenten aan/in miniaturen voor deze Gele Salon, Josje. Je hebt prachitge nieuwe aanwinsten toegevoegd aan deze salon en je collectie. Geniet van het buitenzijn in de zomer, ik wou dat ik dat ook kon zeggen als het mooi/warm weer is ;). Kan je niet goed tegen de warmte Ilona? Nou moet ik zeggen dat het hier vaak wel 6 graden koeler was dan in het oosten van het land, en altijd met een briesje, dus dat was best uit te houden. Kensington was erg leuk ja. We hebben een bliksembezoek afgelegd, voor herhaling vatbaar! Muy bonitas las compras. Me encantan los geranios y el contraste con la elegancia del candelabro. So do I Isabel! Thank you! Oooohhh Josje, what a lovely and perfect for this room chandelier you found!!! Great choice! And the Pelargoniums are gorgeous.... made of metal??? This salon is really starting to "shine" and I love the way those "swags" are repeated throughout the decor! The other pieces you have are perfect... especially the silver candelabra! I always have to remind myself that your room is a miniature version.... it looks so real I am fooled Every time!!! LOL! I hope so too Betsy! Yes, the flowers are metal, brass I believe. 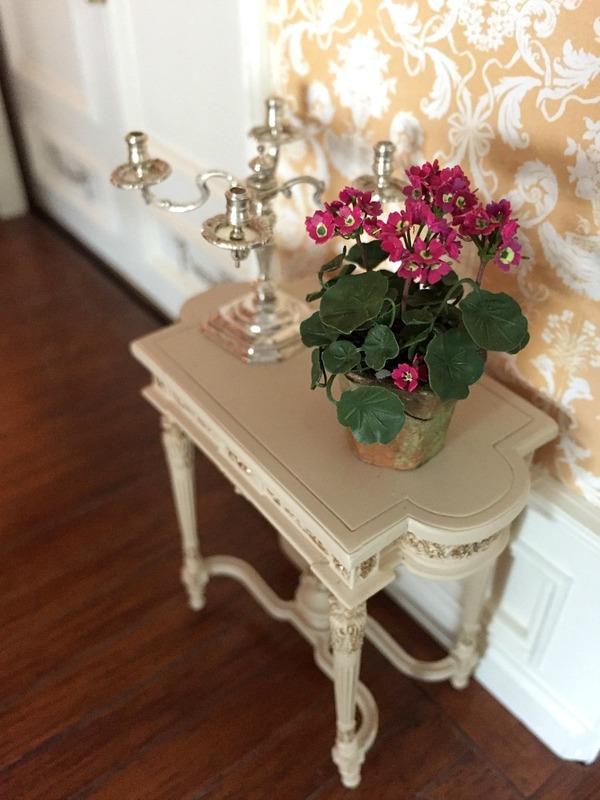 Metal flowers are found in many antique dollhouses. They really stand the test of time. I think the leaves on the chandelier, although made by someone else, also come from material to make metal plants. The geranium is beautiful and I think it adds a human touch, so the room feels like it is lived in, not a museum. Plants and flowers really seem to make scenes come to life. Beautiful work! Completely agree with you Shannon! Thank you! Beautiful purchases!!! They go so well in the room. Thank you! What is the name of your blog? The Kensington Fair seems such a while ago now and you made some lovely purchases. I especially like your flowers - so dainty. This room is coming along beautifully. Thank you Irene! Were you at the Kensington Fair? Thanks Julia! Yes, it makes the house less 'cookie cutter' as they say.